When I first smelled Story on a test card, I was less than impressed. Does the world need another fresh vetiver à la Guerlain Vetiver or Thierry Mugler Cologne? I tossed the card in my purse and went about my business. Surprisingly, given how light a scent Story is, the smell lingered in my purse for days, and you know, it smelled pretty darn good. Eventually I decided Story needed a real try on skin. Story's top notes are just brilliant: the citrus is so bright and sparkling that it seems to jump off the skin, and the peppery-earthy vetiver, one of my favorite smells in the world, grounds it nicely as the citrus fades (sooner than I'd like, as always). The dry down is a sheer, lightly grassy green vetiver with a whisper of jasmine. It has a nice bite to it, but it is not quite as spicy as the Guerlain, and it is clean without being in the least soapy. There is also dry wood, and something that smells like rocks warming in the sun and which gives it, as Marina pointed out on Perfume Smellin' Things, some affinity with Terre d'Hermès. Story is not a massively unusual fragrance, but it is massively likeable, and perfectly unisex. If you're wavering, the charm of the packaging may reel you in. I love the geeky model in the ad, and I love the use of the typewriter font (apparently from Smith's own Olivetti) on the bottle and box. The bottle itself is shaped like a book, with one side rounded like a book spine and the other side ribbed to represent the pages. None of it really resonates with the fragrance itself (try as I might, I can't smell anything like "vintage book" in Story), but it is cleverly done. Paul Smith Story is an Eau de Toilette (30, 50 and 100 ml) and the lasting power is good despite the sheerness. Paul Smith Story is available now at Neiman Marcus, and will presumably be in wider distribution eventually. Story is also available in a wide range of matching body products. “Story is not a massively unusual fragrance, but it is massively likeable, and perfectly unisex.” Hear, hear! 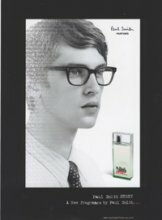 I also love the “hot geek” in the ad. So glad we agree on this one. I wore my sample of story yesterday. I liked it, didn't love it. You're right, it's not unusual. And I seem to always want something different in a fragrance so I won't be needing this – but for what Story is, I think it's well done. Longevity was decent for a lighter fragrance. I had to wear a lot to smell it, though. This one is sort of a sleeper. It took a few tries to appreciate, which is also true of Thierry Mugler Cologne, I think. I liked 'Story' very much, and was really, really tempted. It's not at all a macho scent, is it? The one thing that stopped me was the similarity to 'Terre d'Hermes' – I'm not sure I could honestly tell the two apart, although I haven't tested them side-by-side on skin. The Hermes turns a little flat on me after an hour or so, which makes me (irrationally) apprehensive about 'Story'. But a very, very nice dry vetiver. You've reawakened the lemming that stirred into life when I read Marina's review! I love vetiver, but hate the soapy aspect of Guerlain's, so I might just love this one. Have worn them together twice, and I'd say it feels like the TdH more than it smells like it, although they do have that warm rock thing in common. The Story is a brighter scent, and way more vetiver-focused. If you wear TdH, Story & Guerlain Vetiver together, after an hour, you'll have a harder time (I think) telling which is the Story and which is the Guerlain after a very quick sniff. It is a funny thing, but I never notice the soap in the Guerlain unless I wear it next to another vetiver. So now you'll have to tell me if you find the Story soapy — I don't at all! Yet another nod of approval for the bespectacled model, who slightly resembles a young Yves Saint Laurent! So my question is: how much “sparkling citrus” is on top? I do like vetiver, but I prefer it without (or with not too much) citrus. Love the geeky-handsome model, though! I guess I need to try for myself. . .
Then I'm guessing it will be more citrus than you'd like, although like most citrus, it doesn't last all that long. I just tried this, and I'm definitely a fan of this. The sparkling citrus seems to stay supported quite long with the help of that vetiver. Spot on with the similarity to TM's Cologne, but I prefer Story more. Funny how I didn't connect it with the smell of books…too soapy fresh for that. On the other hand, if I were to connect the smell of a book to a scent, it would be Canabis Santal where that peppery dry Canabis and Patchouli notes meet with the sweet and semi sharp note of rose. Story is so easy to wear and definitely a nice scent to wear on those unfussy, time-to-relax days. I need to try Cannabis Santal again — only tried it on a card, and was very surprised by how sweet it was. If there was peppery-dry anything, I missed it! Story first caught my attention when I read it was four years in the making. I can appreciate a product that is taken seriously. I will still be checking Story out, but from the review my initial impression is that Story isn't exactly what I'm looking for. I already own a fragrance with bright and sparkling citrus and having forgotten my bottle of john varvatos in my carry on, the subsequent search at the airport has left me without a more masculine fragrance. I do not have the palette to detect 'rocks warming in the sun' so I was wondering if there were any suggestions for a fragrance that is a bit more distinctive and masculine than Story without being kitschy. I enjoyed the leather and balsawood in the varvatos but I am always open to try new things. Any suggestions? Not that I don't have complete faith in the pretty twenty two year old fragrance assistant at Nordstrom's, bless her heart, but there is safety in a multitude of counselors. Cheers! …but you're not going to find it at Nordstrom. Knize 10 might also suit you. If we're sticking to Nordstrom, try Bvlgari Black or the new Prada for men. bough it and love it! I feel fresh and clean.It's a very good fragrance for Rio de Janeiro. Maybe there's something about unissex that I like! You know, I called Story a unisex because to me it is…but it isn't marketed that way — it's a men's fragrance! Would think it would be perfect for Rio & hot weather.